Our group of longtime friends gathered for a week in Baja. We spent the first night camped in Catavina. Blooming desert!! Second and third nights at Ojo de Liebre enjoying the whale show and Polo the best guide for 2 days. Next off to Sierra de San Francisco for a 3 day mule ride into the Canyonland: Tierra de los Arces. Our guides were Angel Arce and Jose Arce. What a hoot they were. We had so much fun and we were blown away by their skill set on mount in some very difficult terrain. It is a 3 hour ride down or up on sure footed Jenny foaled mules. It felt good to ride again. Angel and Jose took good care of us. Their singing and laughter was infectious and I can still hear it everyday. Camp was made and we spent 2 days exploring the cave sites of Santa Teresa. Spectacular country. It was the first time to Baja for some of our group and the first time for any of us to do the mule ride down to Santa Teresa. I had hiked in years ago from Santa Marta but the mule trip with the mules working their sure footed magic with Angel and Jose singing, talking to the pack, moving us along, it is a thing of beauty and I am so grateful we did this trip. Sounds like you guys hit the trifecta!!! We have never gone and those pics sure are inspirational. Thanks for sharing. in Baja with genuine ranch folk scratching a living from the land. One of our group was Jude, from Oregon via England, a master horsewoman and breeder of champion Akhal-Teke horses. Jose and Angel were so impressed by her skills they asked her to help tack up the burros and mulas for our ride back up the canyon. Just goes to show, horsemanship is a universal language spoken with deed not tongue. Jude doesn't speak much Spanish but it did not matter. Angel, Jose and Jude were blood related through their mutual love and respect of equine beings. I was on Oaxaca, a very stout mula of about 14 hands. She was steady as a rock and studied every move twice before she made it while at the same time keeping a distance from Angel who loved to crack his whip against his chaps to keep the train moving. It was beautiful country we rode through, just scratching the potential. Angel and Jose spoke to us of a 20 day rancho trip where every day you move and visit a new place, a new rancho in the valley and thus see the entire region. They really would like some good date palm nursery stock and vegetable and flower seeds too are welcome and bee supplies also. Ambling from rancho to rancho, planting date palms, flowers, vegetables and dropping off a queen bee and some supers here and there too. Food for thought indeed. Thank you for the trip report. It's is good to see that you are physically able to have another Baja canyon adventure. Those are great photos that accompany your report. Your report has got me itching to get back out there, myself. Anytime Shari you are welcome at our fire. Nice to have met you and SWD as well. Jose and Angel loved the carne and even enjoyed the kale and chard too. They had never ate food like that before on their many previous trips and were so grateful. Dez Rat, good to hear from you old amigo. The new knees are working well and slowly I'm getting back in the saddle so to speak. You are the hiking man! Ambling from rancho to rancho, planting date palms, flowers, vegetables and dropping off a queen bee and some supers here and there too"
This appeals to me. Do you know more about it? The date palms are donated by participants? What time of year? I have heard that many folks donate the seeds for veggies and for flowers! What a trip you took! Oaxaca is a gorgeous animal and so fun to hear that Jude spoke horsese with the guys! Synopsis: Border run to Cataviña the desert is in bloom! Cataviña to Laguna Ojo de Liebre, Laguna Ojo de Liebre 2 whale outings and the whales want to play. On to San Ignacio to pull permits, San Ignacio to Sierra de San Francisco last few klicks are on a rough, narrow Baja trail, we crawl up to hook up with Jose, Angel, Suko the 14 year old wonderdog, mules and donkeys for 2 nights 3 days in the Canyons. Back up to Sierra de San Francisco. Say goodbye, now to Bahia de Los Angeles for a hotel stop and wind tolerance check. Yep it still gets windy in la Bahia. On to San Quintin, Jardines for a room and supper. Out early to border, only 30 minute wait and no secondary, karma, home. 43 hours drive time, 1500 miles, No ticket, no accidents, no problems. Big Red and the Lance get er done. This video is a bit long but it does cover our trip pretty well. Great pictures Don Jorge, looks like it was a nice journey! Wow, I didn't know Baja had scenery like that - fantastic! The singing is the best part. I've been muling in Baja several times, with Trudi, Chema, Santos, and other guides. On one trip, I brought my bowed psaltery. 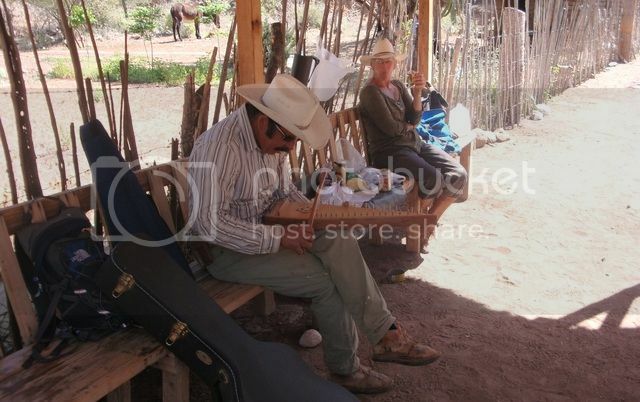 Here's Chema at base camp (Trudi in the background), working out "Cielito Lindo." Where was this ride? Do you have contact information?